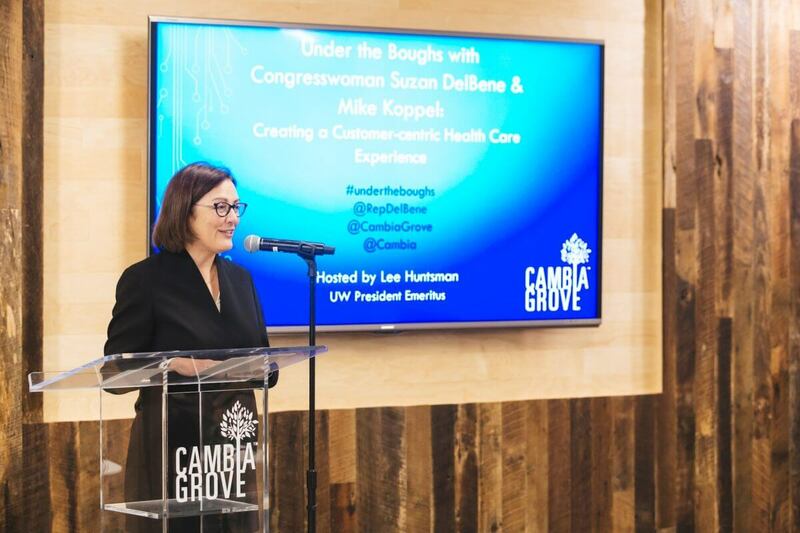 “Under the Boughs: Creating a Customer-centric Health Care Experience” welcomed Congresswoman Suzan DelBene and former CFO of Nordstrom and current Board Chairman of Cambia Health Solutions, Mike Koppel. The presentation was hosted by Lee Huntsman, University of Washington President Emeritus. Congresswoman Suzan DelBene (D-WA) has a background of technology and biotech and prioritizes health care quality and access. She began by talking about the complicated landscape of health care today and how it is a hub of innovation. She explained how we have challenges when trying to move things forward, such as the way we look at policies and the way we look at budgeting from a congressional standpoint. For example, when you put forward a piece of legislation, it gets a score that says how much it is going to cost. However, health care innovations can be more challenging because there are costs upfront that can be very expensive, so in 10 years you may not see that benefit come through. That is why Medicaid may look at innovation and think that it cannot get to market fast enough. She asked, “how can we be forward looking?” DelBene wondered how we can craft health care policy in order for meaningful innovations to get to patients quickly and be affordable. Finally, she spoke to value-based health care, emphasizing that it can only happen if providers have the tools and data to change the way they care for patients. Mike Koppel, former Executive Vice President and Chief Financial Officer of Nordstrom, has been on the Cambia Health Solutions board since 2009 and has been the Board Chairman since 2017. Koppel discussed his background in the retail business and how there is significant value in having a person-centric business model. With his retail experience, he has seen how so many things are focused on speed and convenience. He challenged, “can you describe that as your health care experience?” Koppel knows the health care system cannot be changed overnight, but that it is unproductive to blame or point fingers at anyone. Koppel went to school in Connecticut and when he came to Seattle, he noticed how the customer service was different in the Northwest and mentioned how successful Starbucks, Costco, Nordstrom, and Amazon are. He asked, “what are we doing to make their experience better?” Koppel emphasized the importance of relationships in health care. He explained how relationships in health care are very transactional, meaning that when a patient is sick, the care provider gives them medicine. Koppel has learned that consumers are people you transact with, customers are people you build a relationship with and believes we need to get back to the basic provider-customer relationship. He explained how there needs to be persistence in order to make change. Koppel recognizes that we live in a culture that has a low tolerance for people who are not successful the first time around, but that you don’t learn anything unless you make mistakes or fail. Overall, in order to innovate, we need to use the passion people have for healthcare to create a customer-centric health care system.